Power and performance go side by side. A powerful SUV means that it can move around the countryside and on the roads smoothly. Certainly, an SUV with a Vee engine under its hood can ensure performance. Well, what you usually expect from an SUV beside luxury? Most of us expect marvelous towing capabilities and even most of us expect agile off and on road performance. Well off course, a standard inline-4 engine would not come up with immense performance. This is what a V6 engine could do. For the year 2017, we have got a number of V6 SUVs. All of them are rich in cosmetic and interior designing. And along with that, they are superb performers. Some of them are extraordinary as they are good off-road and even on-road. We have listed the top 10 V6 SUVs 2017 basing the drivetrain, cabin, and cosmetics. The Ford has been prevailing in the market as the family car expert. But it even has its roots in the production of performing SUVs. 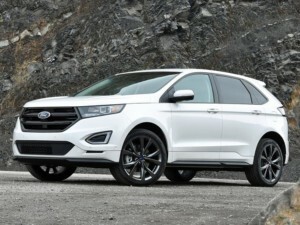 The Ford Edge is one of the present examples of Ford’s interests in the powerful SUVs. The Edge is powered by a 2.7 L Ecoboost twin-turbo V6 engine rated at 315 hp making 350 lb – ft of torque. This powertrain is only available in the Ford Edge Sport trim. Well, with this powertrain Edge took 5.6 seconds to launch from 0 – 62 mph. Further, its top speed is 132 mph (limited). The Dodge is famous for its muscle cars and performance sedans. Along with that, the Dodge SUVs even have a lot of fame. 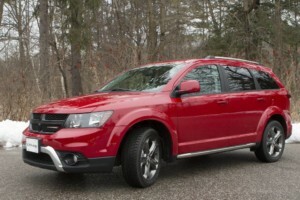 The Dodge Journey ranks among them. A 3.6 L Pentastar V6 engine is available for the Journey. This powertrain is rated at 283 hp of power delivering 260 lb – ft of torque. Further, Journey takes 7.8 seconds to reach the 0 – 62 mph mark. And its top speed is 118 mph. Indeed, it’s a family V6 SUV. The Mitsubishi even shares a pretty good platform for the performing SUVs. 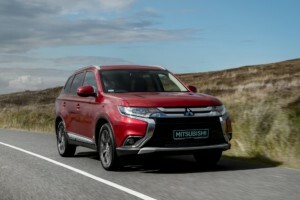 The Outlander, one of the notable SUVs from Mitsubishi has the 3.0 L V6 engine. This powertrain is available only in the Outlander GT models. Well, this V6 engine has 224 horses, galloping at 204 lb – ft of torque. With this powertrain, the Outlander sparks from 0 – 62 mph in 7.6 seconds and has a track best of 115 mph. The Kia has been researching and developing performance rides since long. Well, these performance rides even include the SUVs. 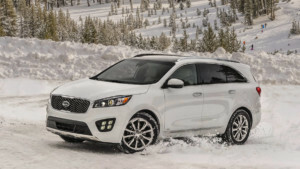 The Kia Sorento is a V6 SUV, having a displacement of 3.3 L. This V6 makes 290 hp of power rated at 260 lb – ft of torque. Well, Sorento is capable of making the 0 – 62 mph run in 7.2 seconds. And its top speed is 125 mph. Hyundai has been providing family sedans and hatchbacks since quite long. But this company is not confined till the chapters of family rides. It even shares some performance cars. The Santa Fe sits among the performance rides from Hyundai. Well, Santa Fe has a 3.3 L V6 engine, having 290 horses making 252 lb – ft of torque. 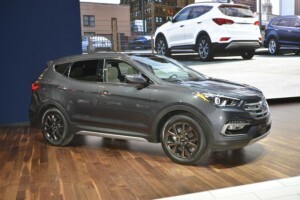 With this powertrain, Santa Fe is capable of running from 0 – 62 mph in 7.1 seconds. Further, it can run till 128 mph. Luxury and Lexus go side by side. Whatever the vehicle you pick from the fleet of Lexus, you will get loads of comfort and luxury inside. But along with that, Lexus equips its cars with performance as well. The Lexus RX has the 308 hp 3.5 L V6 engine which is rated at 280 lb – ft of torque. Further, this powertrain covers the 0 – 62 mph mark in 7.7 seconds and tops at 124 mph. We don’t really come across diligent SUVs from Japan. It’s mainly because the Japanese automobile manufacturers focus on building family rides rather than performance rides. But still, there are some excellent SUVs produced there. 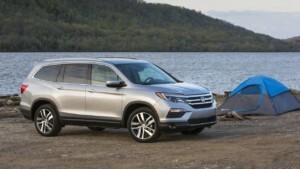 The Honda Pilot is one of them. The Pilot is even one of the fun to drive cars. Well, this car is equipped with a 3.5 L V6 engine rated at 280 hp of power delivering 262 lb – ft of torque. You can’t really doubt the performance of the Pilot. She can make a run of 0 – 62 mph in 6.2 seconds and has a top speed of 112 mph. Along with that, it delivers a decent fuel mileage. 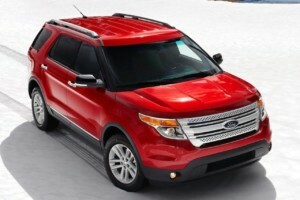 The Ford has presented Explorer with an improved mechanics for the last model year. The same performance schedules are followed to the present year. Well previously the Explorer was able to make the 0 – 62 mph run in 7 seconds. But now this monster has become enough powerful to make this run in 5.8 seconds. Further, the top speed is same as it was before which is 122 mph. And even the mechanics don’t even differ at all. It has the same 3.5 L V6 Ecoboost engine with 290 horses galloping at 255 lb – ft of torque. The only this that differed is the transmission line that has been upgraded. 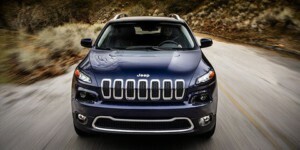 The Jeep Cherokee is one of the oldest SUVs alive today. Long ago the Cherokee was introduced in the market, with a cubic shape designed specifically for the off-road use. But with time, the Cherokee has developed enough to lead the roads and the countryside trails. The Pentastar is one of the favorite engines used by the General Motors’ Companies. The Cherokee even gets a V6 Pentastar with a 271 hp 3.2 L engine. This powertrain makes 210 lb – ft of torque. Well, Cherokee is no more shy to perform. It takes 7.5 seconds to Cherokee for reaching the 0 – 62 mph mark. Along with that, the track best of this V6 SUV is 119 mph. The Toyota Highlander even takes part in the list of performing SUVs. 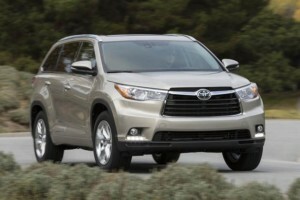 In 2016, the Highlander received a new engine for its drivetrain, borrowed from the Lexus RX. Previously, the Highlander was utilizing a hybrid V6 drivetrain. Well, the present day powertrain has a 3.5 L V6 engine rated at 295 hp delivering 263 lb – ft of torque. This powertrain enables Highlander to peak with 115 mph and launches from 0 – 62 mph in 7.6 seconds. If you have any other car you want on this list then let us know. Your comments and feedback are very important to us.